The fisher (Martes pennanti) is a medium-sized carnivorous mammal and an important furbearing species. Fishers have a low reproductive rate and are easily trapped. These factors, in addition to habitat loss and overharvest, nearly brought the species to extinction. In Minnesota, harvest management has been fairly successful in maintaining the fisher population. For continued success an accurate model of population growth is needed. To predict trends in fisher populations, we built a stochastic Lefkovitch stage-based matrix model. A stochastic model is one in which probability distributions are used for the values of the variables involved, allowing for a more accurate depiction of population growth. The Lefkovitch matrix predicts future population levels by dividing a population into various developmental stages, such as juvenile, sub-adult, and adult. Rates of fecundity, mortality, and survival into the next stage were defined for each of the stages. Due to the lack of specific demographic variables for fisher populations in Minnesota, we used data from populations in several other similar regions. We tested the sensitivity and elasticity of this model and found that it was most sensitive to harvest mortality. Results from this model will allow managers to make more informed decisions on fisher harvest regulations. Branscombe, Daniel. "Stage Based Population Model for a Harvested Population of Fisher." 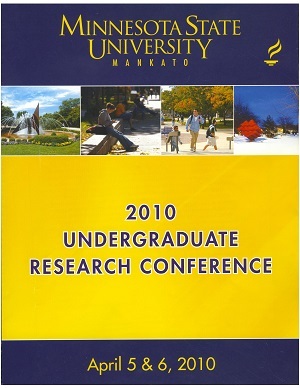 Undergraduate Research Symposium, Mankato, MN, April 6, 2010.